Engineering researchers at The Ohio State University have developed an innovative design and production process for the diodes that enable lasers, solar cells, LEDs and almost any electronic and optical devices to exist. Most modern electronic and optical devices contain diodes that are formed through a process called impurity doping, which is accomplished by adding a few foreign atoms at parts per million concentrations to a semiconductor. From microwaves to computers to iPhones, diodes are everywhere, and impurity doping has reigned as the most effective technique to make diodes for nearly six decades. However, as researchers push to create smaller and smaller nanoscale devices, the number of impurity atoms present in electronic devices becomes so small that electrons do not flow uniformly in the device. A team of six researchers led by Roberto Myers, an assistant professor of materials science and engineering, succeeded in creating a new type of diode that combats these uniformity issues by varying the chemical composition of a nanoscale semiconductor alloy. By smoothly grading the composition of a semiconductor, the team took advantage of the built-in polarization properties of the atomic arrangement of the material. In this material, the polarizations of neighboring dipoles are no longer the same size, leaving behind fixed charges. The resulting material conducts electricity without requiring any impurity atoms. STEM image of a single nanowire heterostructure with Z-contrast to reveal GaN (bottom). Debdeep Jena and colleagues at the University of California, Santa Barbara invented the concept of polarization grading in 2002. Later, at Ohio State, Myers and Siddharth Rajan, an assistant professor of electrical and computer engineering, built on the idea by extending polarization grading to create diodes in nanowires without impurities, an idea that is currently being patented. Santino Carnevale, a graduate student working in Myers’ lab, developed a synthesis method to build these miniscule structures on silicon wafers through a process called molecular beam epitaxy. 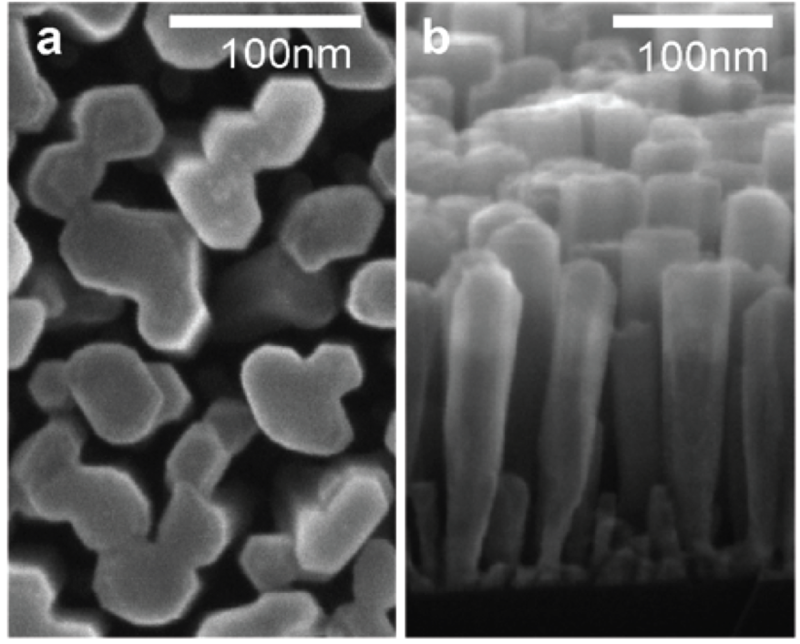 The team observed that these nanowires behaved as diodes, representing the first semiconductor pn-junctions that do not contain intentional impurity doping. The researchers then inserted thin layers of semiconductors, called quantum disks, at the center of the nanowire diodes in order to make the nanowires behave as LEDs. Graduate student Thomas Kent observed that these produced deep ultraviolet (UV) light. Deep UV light can be used to disinfect water, detect biological and chemical agents, and for various medical uses. So far, LEDs that emit UV light have been difficult to produce. These new diodes could be good candidates for efficient LEDs, as well as new types of transistors, photodetectors solar cells, and lasers.